When I was a child my mother had a rather strict clean plate rule, which meant no getting up from the dining room table until everyone had cleaned their plates. I sat through many university-worthy lectures on the poor starving children in other corners of the world, who would have been grateful for the warm meal which I was distaining. On more than one occasion I expressed concern for those poor starving children and offered to send them my carrots, but for some reason she never took me up on the offer. Stubbornness may well run in the family because it took years of skirmishes in the ongoing carrot wars before she finally softened and decided that not everyone should have to suffer. And so the rule changed so that only the person who hadn’t cleaned their plate had to stay at the dining room table. She had the advantage of a well-designed house because from the living room she could see me take my cleared dishes into the kitchen and could then verify that the plate was really clean. But, as I would later come to appreciate, she could not see into the dining room itself. Carrots may have been the most common cause of our nightly hostilities, but they were hardly the only culprits. I have vague memories of staring balefully at plates of brussel spouts, zucchini, lima beans, and the thankfully rare but always dreaded fish soup. Desperate times call for desperate measures and it was the hated fish soup which finally motivated me to find a solution, salvation in the form of a houseplant. We didn’t just have a few houseplants, we had a virtual greenhouse full of them, and in the dining room we had a particularly large fern which needed a particularly large pot. To this day I still remember the first time it occurred to me that that pot might just be big enough to hide a bowl of fish soup (and yes, I remember that it was fish soup) without being noticed. Had I been old enough to consider the potential consequences of rotting fish in our dining room, I probably would not have attempted it, but I wasn’t and so I did. And over the years that fern grew bigger and bigger and seemed to thrive on its occasional late night feedings. So, as you see, fish soup and I have a checkered history. 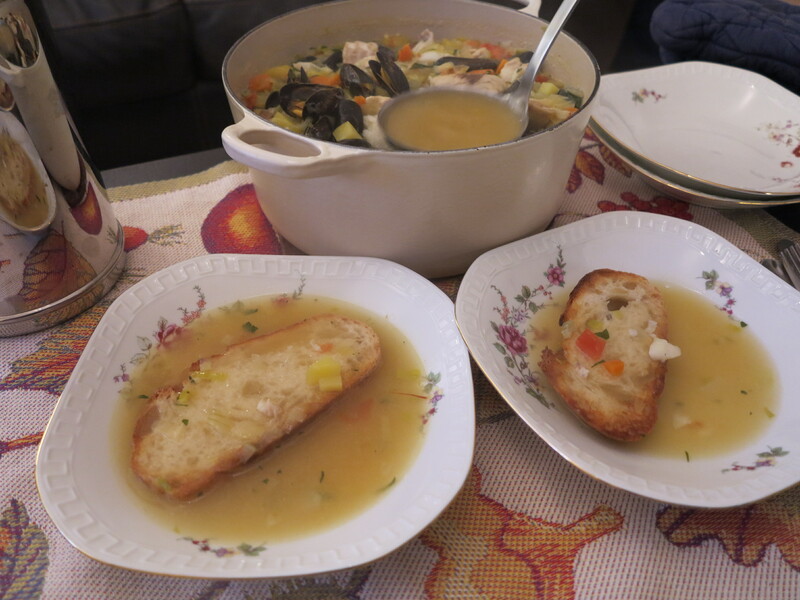 I’ve since learned to love it in the form of a hearty bouillabaisse, but this week’s French Fridays with Dorie recipe hit just a little too close to home and jogged those childhood memories loose. At this point though, I don’t have any (still living) houseplants and had to rely on my husband to get rid of the leftovers. 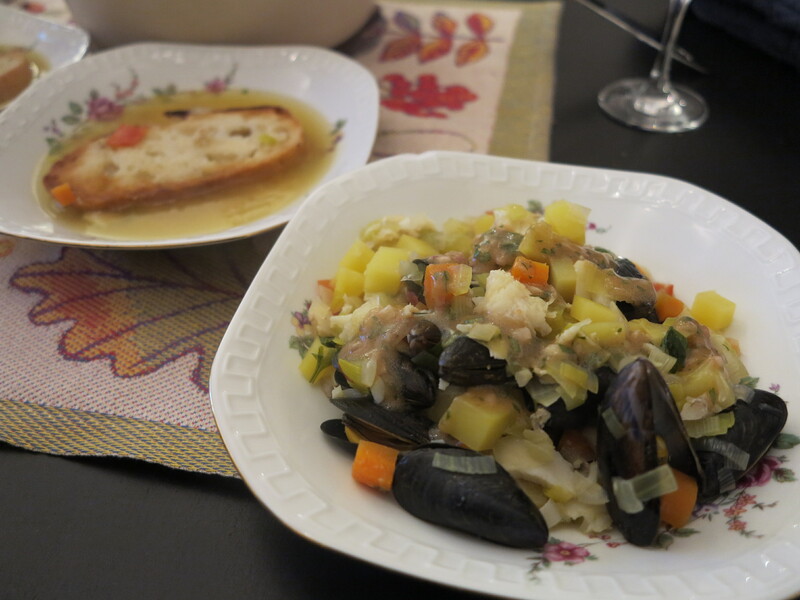 This entry was posted in french fridays with dorie and tagged Around my French Table, fish, soup. Bookmark the permalink. I love, love, love that story! Surely, our mother’s went to the same “clean your plate” school. Beets and liver were the two that caused me the most angst. My parents didn’t have a dining room – we ate in the kitchen; I was the only child living at home – there was no escape. I sat until I ate every last drop. (One of my parents always used to say “It won’t taste any better if you let it get cold”). Sigh. Your post is cracking me up. While we didn’t have to clean our plates, we just had to try everything on our plates, I did use the same rejoinder to my mother when she told me about starving children elsewhere. She didn’t take me up on my offer either. Sorry you didn’t enjoy this soup. I was wishing you had some houseplants to nourish with this one. Happy New Year, Rose! At least it prompted some entertaining memories for you! We had to clean our plates, too, and there was a clear view of the dining room from the living room, with no helpful plants in sight. I’m sure my brother would have liked that option on the nights my mother served peas or liver. I haven’t made this yet, as I’ll be on my own for it. What a great story! I’m amazed that your houseplants survived the fish soup treatment 🙂 Too funny. I was lucky in that regard. My psychologist parents were big on not trying to make us do anything that we didn’t want to do….I didn’t love this soup either. My poor husband has had a lot of leftovers to eat. Kudos to you for making this soup despite your checkered past with fish soup. What a great story. My husband loved it more than me. I decided that I don’t like mussels. Happy new year. Fun post! My husband has some similar memories, and to this day hates beets. Luckily you had someone to help you eat the soup!